I haven't done an outfit post in ages so here you go! This tends to be my go-to outfit when I'm going out (minus the sunglasses of course), every now and then I like being a bit more gothic and I really loved the all black outfit with my pink hair :3 I really want it dyeing permanently now! There's only a day left to enter my Limecrime giveaway so make sure you don't miss out! 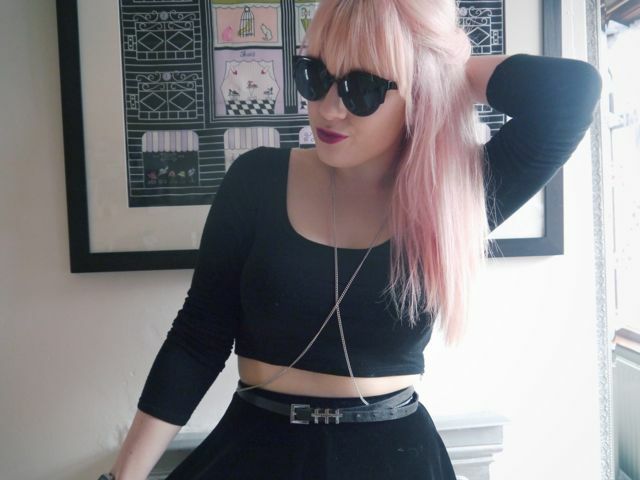 Your hair is seriously amazing, and I love the outfit, you really suit crop tops! You look stunning, mega hair envy! I'd love for you to enter my giveaway to win some glasses of your choice that ends in 2 days! Love the body chain thing! Adds an extra cool element to this outfit! Your hair is so cool! Love the outfit! Ahh I've been looking for a top like that!! This is so gorgeous! I really love the belt, you're definitely rocking the rock chick look!! I've just looked through pretty much most of your posts and they are all so amazing and stylish! Wish I could pull stuff off like you can. Following!